Prime Minister Narendra Modi on Monday visited the Bhabha Atomic Research Centre (BARC) in Mumbai and interacted with scientists. He was briefed by Dr. R.K. Sinha, Secretary, Department of Atomic Energy and other top officials and scientists at the Bhabha Atomic Research Centre on India’s atomic energy programme; DAE’s extensive research and development and education programmes; and DAE’s contributions in other areas such as healthcare, especially cancer treatment, food security, solid waste management and water purification. Referring to the Diamond Jubilee of DAE, which falls on August 3, the Prime Minister asked Department of Atomic Energy to draw up a programme of year-long celebrations, with special focus on the various human and developmental dimensions of atomic science, with special outreach to the youth in schools and colleges throughout the country. The Prime Minister exhorted DAE to present the human face of India’s capabilities in nuclear science throughout the world. Prime Minister was apprised of the safety and security measures adopted by the DAE and India’s excellent record in this regard. 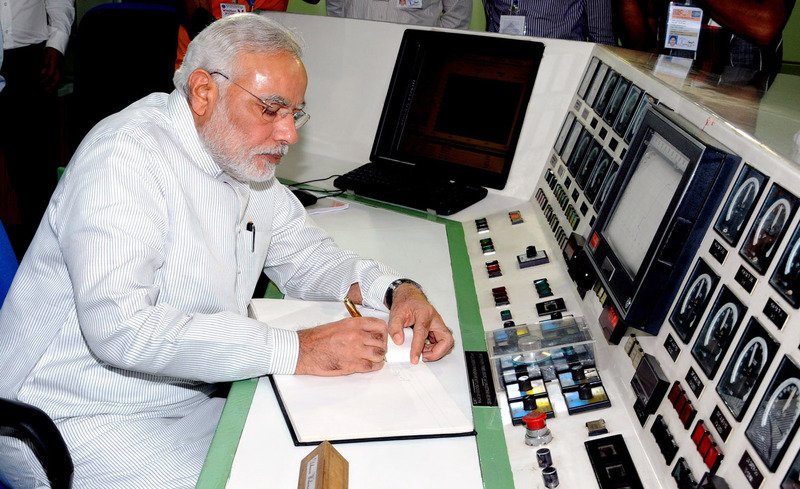 During the visit, which lasted four hours, Prime Minister was also shown some of DAE’s most advanced facilities at BARC, including the Dhruva Research Reactor. Prime Minister expressed his strong appreciation for the extraordinary achievements of Indian scientific community in one of the most complex and challenging fields of science and technology. He said their success was especially creditable because it took place in the face of decades of international technology denial regime; India’s self-reliance in the nuclear fuel cycle and the commercial success of the indigenous reactors demonstrated that with vision, resolve and hard work, India could be a front ranking country in the most challenging fields. Prime Minister reiterated his belief that energy security, which was increasingly based on clean and reliable sources of energy, was the critical driver of India’s rapid and sustained long term development. He saw an essential role for nuclear energy in India’s energy strategy, given the scale of demand in India. Prime Minister assured the DAE of his full support in the implementation of DAE’s ambitious expansion programme and expressed hope that DAE would meet the target of increasing the capacity by three times from the present level of 5780 MW by 2023-24 within the projected cost. He underlined the importance of ensuring that nuclear energy remained commercially viable and competitive with other sources of clean energy in the long run. He also asked DAE to continually upgrade technology, both with regard to our long term plans and international trends. DAE, he said, must also plan for ensuring adequate availability of skilled human resources in the country. Prime Minister told DAE that nuclear safety and security were of the highest priority for him and asked DAE to ensure that India’s standards and practices were the most advanced in the world. He also asked DAE to pay special attention to the local communities in planning and implementing nuclear power projects. He hoped that role of industry in providing equipment and systems for the nuclear programme would continue to grow and recognized that adequate incentive structure should be exist to facilitate that. He noted that we would need to tap additional sources of investments for our ambitious expansion programme. He welcomed India’s growing international partnership in the nuclear energy and hoped for timely implementation of the ongoing projects in a manner that they met the requirements of techno-economic viability and safety standards. Technology transfer to India, he observed, was a vital element of his vision for international partnership in India. Prime Minister lauded the contribution of DAE scientists in the critical area of cancer research and treatment through the Tata Memorial Hospital. He hoped that DAE would soon implement the planned projects in Chandigarh and Vishakapatnam and would take one of the most advanced standards of cancer treatment in Asia to other parts of India. He also directed DAE to make special efforts to expand its research and extension on a national scale applications of atomic science in areas like healthcare, waste management, water treatment, agriculture and food preservation. Prime Minister congratulated DAE on the important milestone of Diamond Jubilee and wished the DAE community continued success in the future. The National Security Advisor, Shri Ajit Doval, the Director, BARC and the Secretary AERC, Joint Secretary in the PMO, Shri Javed Ashraf, and Private Secretaries to the PM, Shri Vikram Misri and Shri Sanjiv Singla were also present.